So yesterday, I went to Walmart to pick up a few things. As I was walking, I saw these beautiful necklaces in the jewelry section. 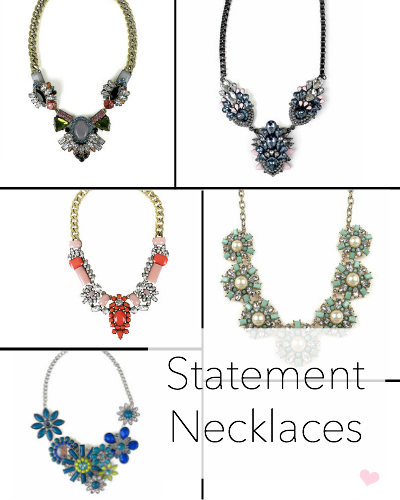 I don't know about you, but I LOVE statement necklaces. They're just too darn expensive; I don't want to dish out 50 bucks for one necklace. I don't care how pretty it is, nor do I care about the brand. Anyway, these beauties were $10 each. Talk about bang for your buck (lol). I was super excited and wanted to buy them all, but I didn't (lol). A few of my favs are pictured above, but there are tons more at Walmart.com.